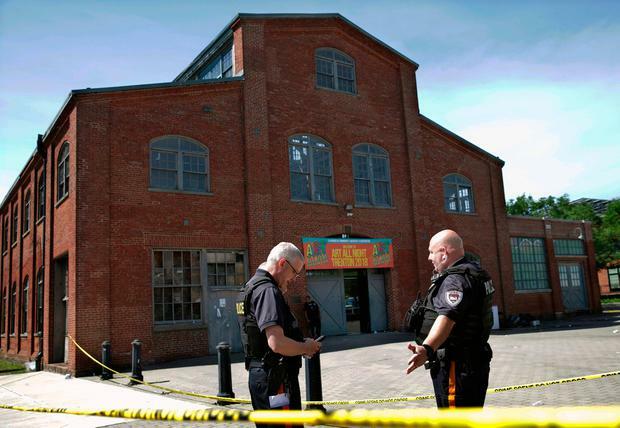 Two gunmen opened fire at an all-night arts and music festival yesterday morning, sending people running over each other in the scramble to safety. One suspect was killed and 22 people were injured. Of 17 people treated for gunshot wounds, four of them, including a 13-year-old boy, remained in critical condition yesterday, said Mercer County Prosecutor Angelo Onofri. The shots rang out around 2.45am during the Art All Night Trenton festival in New Jersey that showcases local art, music, food and films. Mr Onofri said a 33-year-old man was killed, apparently by police, and the second suspect was in custody. He said a neighbourhood dispute was believed to be behind the shooting. Crime scene tape surrounded the site yesterday of the historic Roebling Wire Works Building that now shares a car park with a supermarket, bank and laundry. US police are also investigating an attempted carjacking that occurred in a nearby alley. Mr Onofri said police were working to determine if it was connected to the shooting. Gennie Darisme was getting ready to leave the festival around 2.45am when she heard shots and saw people running. Theresa Brown, who has been volunteering at Art All Night for 12 years, said she was leaving her volunteer shift around 2am when she heard “pop, pop, pop. I thought it was a car backfiring,” she said. “We’re very shocked. We’re deeply saddened. Our hearts ache and our eyes are blurry but our dedication and resolve to building a better Trenton through community, creativity and inspiration will never fade. Not tonight. Not ever,” festival organisers posted on social media last night. A spokeswoman for St Francis Medical Centre in Trenton said 10 men and women, ranging in age from 17 to 48, were being treated for minor injuries. They were in various stages of being released, she said. Spokeswoman Kate Stier said they had “at least 16” patients there, including the 13-year-old boy in critical condition. That total may not include people treated and released. Trenton Mayor Eric Jackson said the violence couldn’t be “discarded as just random violence; this is a public health issue”.